Selah is a unique grassroots community with Selah School as its core. Selah is growing and evolving, and our families and teachers are deeply invested in making it a success, providing input to make the education relevant and meaningful. Students and teachers hold lively debates about Jewish values, bake and prepare Jewish foods, hold lively Hebrew singalongs and joyously celebrate holidays. It’s run loosely as a co-op, with parents contributing time and skills towards the smooth operation of the school and building a fulfilling community experience for its families. We also create and maintain a website and Facebook page, plan social and volunteer gatherings and take turns with school snack. Selah works closely with Congregation Agudas Achim to create adult and family learning opportunities and to provide social events with Rabbis Swedroe and Blumofe and Dr. Harvey Raben. We jointly host monthly dinner conversations with Dr. Raben as well as quarterly brunches with the Rabbis, Friday night shabbat services in Zilker park, and Saturday morning children’s services. The Selah community is also invited to participate in Agudas events and other Jewish events in the greater community, so we have a rich and colorful calendar of activities. These activities are offered specifically to current Selah School families. Mike and Nina moved to Austin in 2006 just before Rafi was born. “We were looking for a warm climate and a liberal, affordable city and loved the relaxed, off-beat vibe and the friendly people. After a few years of sampling the Jewish scene we discovered the newly-created Selah and attended a kabbalat shabbat service with Rabbi Kobrin. It reminded us of B’nai Jeshurun in NYC where we met—musical, animated, soulful and uplifting. We joined the Selah leadership committee and are so proud of the community we helped create." Mike is a software engineer and Nina is a family photographer (who has been documenting Selah School since its inception). Rafi is a curious and creative 10-year old who attends Acton Academy West—a new experiment in progressive education. We enjoy biking around the city, growing a vegetable garden, making smoothies, playing laser tag, and exploring other countries. We are the Ansels, a peace-loving people from South Austin. We helped to create Selah because we wanted an alternative service in our part of town that was informal, spiritual, musical, warm, welcoming, and sweet–just like Austin. David is The Soup Peddler and Meredith is The Speech Pathologist and Mia Rose is the coolest little Jew on the block. Brian is a native Austinite, a lapsed pianist, a born-again runner, a computer scientist, a natural skeptic, and a man who appreciates a good bowl of matzoh ball soup. He’s also a fan of Selah’s mix of progressive ideology and traditional ritual. 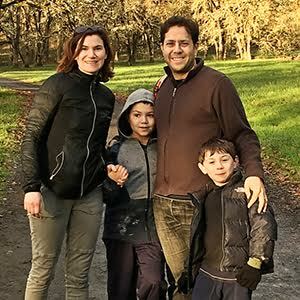 He lives in South Austin with his wife Elaine and son Eitan, and tries to do his part to make Selah a community where modern Judaism can flourish. Alex and his family, Rachel, Sam and Ethan head to Selah every chance they get (but not nearly as often as they’d like to). There is something for everyone, and best of all it is right down the street! Alex does his best to keep up virtually as well by helping to maintain the website. In other words—if you see typos— you now know who to blame! Adam grew up in Denver, Colorado. After marrying his wife Rose in 2005 they moved to Austin to be closer to Rose's family. He works as a professional civil engineer for Jacobs Engineering. Rose and Adam have two children, Eliana and Maxwell ages 10 and 6. Living in South Austin they were very excited when Selah formed and have been with the group since the school began in 2011. Having grown up in Silicon Valley with a large and largely unaffiliated Jewish population, I have a deep appreciation for innovation and the power of lay leadership in creating strong communities where people take ownership of their Jewish experiences. I am passionate about finding ways to make Judaism relevant and meaningful to our lives and am thrilled to be a part of Selah’s mission to create a grassroots, reinvigorated Jewish community in South Austin. My husband, David Goodman, and I are so happy to be a part of the Austin Jewish community. I received my rabbinic ordination from the Jewish Theological Seminary in New York, concentrating in Pastoral Care. In an effort to make Judaism more accessible, I incorporated theater and movement into the study of traditional texts. Before arriving in Austin, I was the Assistant Director and Campus Rabbi at the Hillel at the University of Florida, working with lay leaders to bring their vision of Jewish life on campus to fruition. I am excited about the possibilities that await us and look forward to meeting you. Dr. Raben earned an MA in Contemporary Jewish Studies from Brandeis University and his doctorate from the University of Toronto in Education. He has served as teacher and administrator in Montreal, Toronto, Seattle and San Diego. He returned to Texas, where he grew up, in 2009, as Director of Congregational Learning at Agudas Achim and has since been deeply involved Jewish education in Austin. A father of 3 children, Harvey and his wife Sandy enjoy the vibe of Austin, especially with one of his home brews, a serious hobby he continues in Austin. From the earliest stages Harvey has supported the creation of Selah, from the ‘heavy lifting’ of setting up chairs at the first Selah services at Casa De Luz to the beginnings of Selah school in South Austin. Harvey has enjoyed the collaboration with Selah’s committed lay leadership and supports Selah in creating its own educational path in South Austin. Since arriving in Austin in 1998, I have dreamt of building and strengthening Jewish life in South Austin—Jewish life that would match the vitality and depth of Austin. I am deeply involved in creating and encouraging music in our city (especially jazz), and Selah is a natural extension of this important work—encouraging relationships and offering an enthusiastic and grounded Jewish practice that is filled with life, joy, and hope.I grew up outside of Chicago and have lived and studied in New Orleans, Manhattan, and Los Angeles. My wife is Ann and we have three children, two here and one in Brooklyn. From whatever place you may come, and whatever your background, Selah invites your exploration, your inspiration, and your presence. So, come join in and lend your heart, head, and hand. May we all together flourish. Rabbi Rachel Kobrin created Selah in 2011 while serving as Associate Rabbi at Congregation Agudas Achim. The idea grew out of her passion for building Jewish community and engaging people in meaningful prayer, acts of social justice and transformative Jewish learning. She also saw a void in South Austin—as all Jewish congregations were North of the river—and wanted to bring a progressive, soulful, and musical version of Judaism to South Austin. She rallied many unaffiliated Jews around her and soon had a dedicated following. The original services were held in the auditorium of then Parkside school on the Casa de Luz campus, and later, at Faith United Methodist Church. She now lives in Philadelphia and serves as the Rabbi of Adath Jeshurun.